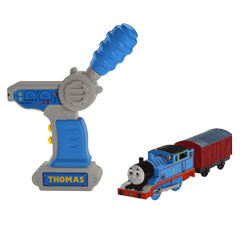 The magic of Thomas & Friends comes to life with remote control action! The TrackMaster Railway remote lets little engineers control Thomas' every move. A push or pull on the handle sends the engine forward or backward with a chug-chug or stops them with a hiss of "steam". Other buttons let children hear engine whistles and the Thomas & Friends theme song too!